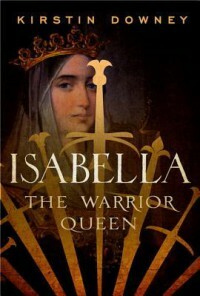 Apart from the bare historical bones and facts of Isabella's story, there is little in this book to be recommended. I posted previously about Downey's offensive, clumsy, and one-dimensional views and explanations of such sensitive topics as The Inquisition and religious persecution. I can't really recommend this book. I suppose it did the bare minimum of what I wanted--an account of Isabella's life--but it severely damages the concept of socially-aware history that is every historian's duty. Love this! 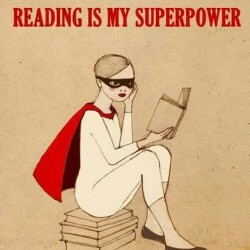 "Secret Weapon= Books"
"Whither is fled the visionary gleam? "He wanted to be worshipped from afar, without the dare of an expectation." Alas! Disappointment, thy name is Julia Fox! Written amateurishly, this is not a book about Jane Boleyn. I was so utterly disappointed, because Lady Rochford is a character of Tudor history into whose story I would have loved to sink my teeth. We know her in popular history as the spiteful, jealous wife of George Boleyn whose testimony sent her own husband, sister-in-law, and, later, the queen she served, to their deaths. But, unfortunately, this book is not about Jane Boleyn. It does not have a firm grip on its subject. The book is 316 pages. It takes more than 100 pages before we are past the generalizations and background stories of the Tudor landscape at the time. This could be forgiven if Fox then dove into Jane's life. Instead, the author danced around her central character. The first half of this book wasn't "Jane Boleyn," it was "The Life of Any Tudor Woman at Court." The prose is riddled with phrases of what Jane "likely would have thought," how she "must have felt," or "what she may have believed." Mistaking the historian's educated determination for vague conjecture, Fox does not tell us what documents, accounts, or other evidence reveals about Jane's life. Instead, she maddeningly and broadly describes the entire story of the six wives of Henry VIII, as though writing a light textbook. She is so determined to pack in every fact about the Tudors that she forgets that the book is supposed to be about Jane Boleyn. Instead, we are treated to a very basic retelling of English history from 1513 to the 1530s. But this book's apathy towards its subject becomes criminal when it discusses those moments in which Jane Boleyn played such an infamous role: her testimony against her husband and sister-in-law. What should have been a climax of the book was, instead, a whisper. In the vaguest move in the book, Fox fails to even examine what Jane said, and why she said it. Mindbogglingly, she glosses over the very incidents that make Jane Boleyn a famous historical figure. We may not have transcripts of what Jane said; but it is the role of the historian and biographer to understand the subject and her landscape to be able to recreate, intelligently speculate, or at least offer some insight into the titular figure. There is no such insight here. We are told that Jane was likely afraid, and likely "told all she knew" about her husband and her sister-in-law. But, wait! WHAT DID SHE KNOW? What did she see? Did she make it all up? Did she lie? Fox doesn't bother even examining these questions. Of Jane's most infamous act, she spins a blurry cocoon of "well, she testified, and she must have been afraid, okay, bye." That was incredibly odd. I kept telling myself that the story would pick up by the time Catherine Howard entered the picture. Alas, no. The essential problem of this book is that Fox tries to tell Jane's story without Jane in it. She has dozens of quotes per page from various respected sources about what was happening at the Tudor court, but she rarely focuses these accounts on Jane. By the time Catherine Howard is being investigated for treason, we, who should be in the author's confidence, are being told after the fact that---surprise! Jane had secured meetings for Catherine and her alleged lover, Thomas Culpepper. Fox doesn't narrate this in real time: that is, she blows through the story of Catherine's reign, dropping no hints that Jane Boleyn, our main character, was playing any role whatsoever in Catherine's infidelities. Biographies are supposed to take us along for the ride with our subject. This book is a watered-down pseudo-history of the Tudors. If you are a newcomer to Tudor history, it might be a nice entry point. 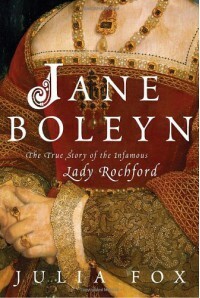 But for people, like me, who wanted a pointed, focused work of historical biography on Jane Boleyn, it fails devastatingly. The one redeeming factor to this book is its epilogue. After 300 pages of conjecture, Fox finally begins to write like a historian in tracing the Jane Boleyn's historiography--in following the way in which the myth of the mad, spiteful Lady Rochford gained traction in English history. And that is the only interesting part of the book. Learning how revisionist Elizabethan historians (no, not Shakespeare this time!) planted seeds of "the bawd Lady Rochford" and how 18th century historians villainized her into the character we know now was wonderful. If only the rest of the book had been given such treatment. I was agog to read this, but was very disappointed. I don't know how many biographies of Jane Boleyn there are, which makes me all the more deflated. This is making me very upset indeed. The author is not a historian. That can be fine, but when you're dealing with biography and history, particularly history of another nation 500 years ago, you need to be a trained historian or, at least, a biographer to understand and clearly communicate the trends and threads in the subject's life. "The Field of the Cloth of Gold occurred in 1520. Here's what happened: [insert entire account of the Field of the Cloth of Gold]. + [Fox remembers she is writing a book about Jane Boleyn] + Per this historical event, we do not know whether Jane attended it, but she likely did because a Tudor woman at court at that time likely would have gone to the event. We also don't know if Anne Boleyn was there, but maybe she was! And, hey, maybe the two of them met! We don't know, but maybe Jane caught a glimpse of her future sister-in-law!" I am by no means suggesting that only historians should write these kinds of books; I just don't think Fox is a good writer. She's been loosely explaining the general world of Tudor politics to me for 150 pages. It's great if you're completely unfamiliar with Tudor England, but not so great if you're looking for a specialized, pointed account of a relatively obscure figure in history (Jane Boleyn), as I was. Also, I suspect most people interested in books like these are not newcomers to the historical atmosphere in which the events occurred. And I know it's important to understand the backdrop of Jane's life, but, for God's sake, in a biography, do not waste 100 pages talking about things that relate little or not-at-all to your subject. This needn't be a speculative "Jane may have done this because many Tudor women did". It needs to be pointed, clearly stated, and even aggressive in tackling its subject matter. Oh, and may I add that dramatic writing has no place in such a book? As in, using fragments for dramatic effect. Case in point: (paraphrasing) "This was not good for Henry. At all." or "This made things hard. Really." That's just not good writing. "We were still using writing to discuss the things we were too afraid to say out loud." "Publication is a form of judgment."